Armed with Strava as my new tracking system and plenty of enthusiasm, I set off on another week of running haphazardly between November 24 and 30, 2014. I started to push boundaries a little in terms of distance which was almost a surprise to myself considering I had no plans of ever going beyond 3km at the start of the week. Looking back on the week, it was a concoction of mixed distances, varying paces and little rest between runs. One thing in hindsight that was becoming apparent was that I had no plan and no goal. I mapped five runs in just four days for a total of 15.7km. It was way too much, too soon, but I was enjoying it and did not know any better. One 3.1km run felt particularly good. 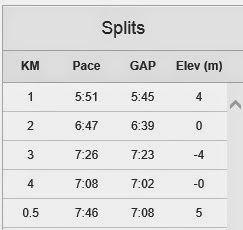 It took 18:55 and had splits all within 15 seconds of each other per kilometre. The worst run (which is the one pictured) was the first little pointer to me that I needed both a training plan and to space my runs a little more. It was 4.5km and I gradually got slower and slower. It was clear that I was also still having a lot of trouble pacing myself and this run was probably the one that made me really start to think about that. I began to peruse as much literature as I could find on running in general. If I was going to keep this up, I had lots to learn. EMBRACE THE CRASH AND BURN!!! Thankfully things have improved, still catching up on here but not too far away.